Beautiful and thanks for the info about this one... Happy weekend Nick. You have an eye for the most gorgeous of blossoms! Hey Nick! Great orchids - and so many of them blooming at once in your garden. I'll bet its great there :) Thanks for hosting! This kind of orchid I'll have to paint at some time -so beautiful! And it seems hardier than some other orchids. Thanks for sharing! Stunning picture of a beautiful orchid!! So beautiful! I would love to grow orchids, but lack the patience! Absolutely beautiful orchids and great information too. Thanks for hosting. Wishing you a wonderful weekend. 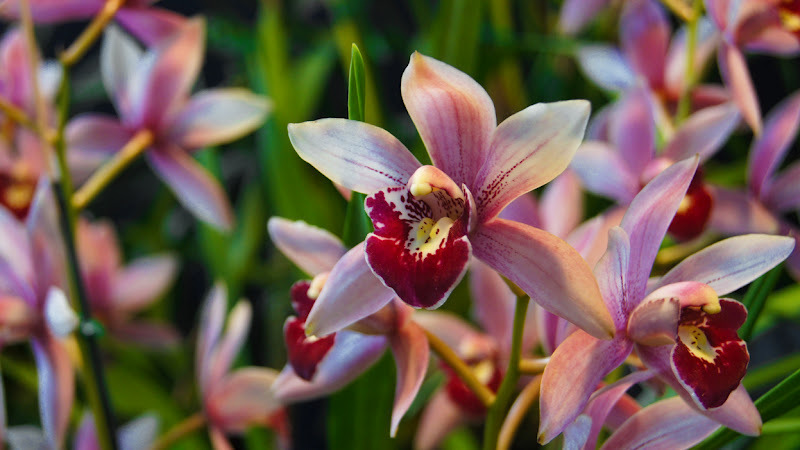 Orchids are very beautiful flowers, delighting us with its long flowering. Stunning orchid variety! Always love the patterns on orchids! So vibrant! Beautiful orchids and great shot! This is a lovely, lovely shot of the orchids! What a gorgeous shot of your orchid! So dainty and elegant. Thank you for hosting our party. Simply stunning. This is one of the most beautiful orchids I've seen. This is a great post with excellent posts and links. I am amazed by the beauty of orchids in our part of the world. Your photo is awesome.